I am not one to pile up professional endorsements “just because”. But when there is an ed tech tool that I have found exceptionally valuable, and that tool conducts a program to recognize people who want to help others get the most out of that tool in helping students, I like to dig into it to see what else I can learn about my favorites. My newest credential comes from one of my longest-running favorites in ed tech: Book Creator. What started as one of my all-time favorite iPad apps is now a first-ballot hall of fame cross-platform application. You and your students can become published authors and create your own high-quality multimedia electronic books. The old excuses and barriers of self-publishing being too hard, too expensive, and too time-consuming are gone. The world is your audience. The newest iteration of Book Creator goes beyond the idea of you becoming your own publishing house, to connecting your classroom, your building, and your district in such a way that you can collaborate in ways that were not possible before. A classroom, building, or district can publish entire libraries of self-created multimedia eBooks! Book Creator is a great way for students to produce their own content-rich textbooks, create memento/souvenir eBooks of special events, get creative with project portfolios, and capture volumes of evidence of their learning with ease! I have to thank Jon Smith and Mike Marotta for introducing me to the incredible power of Book Creator back in its early days, and for creating challenging ways to use it to help all (yes, ALL) students. 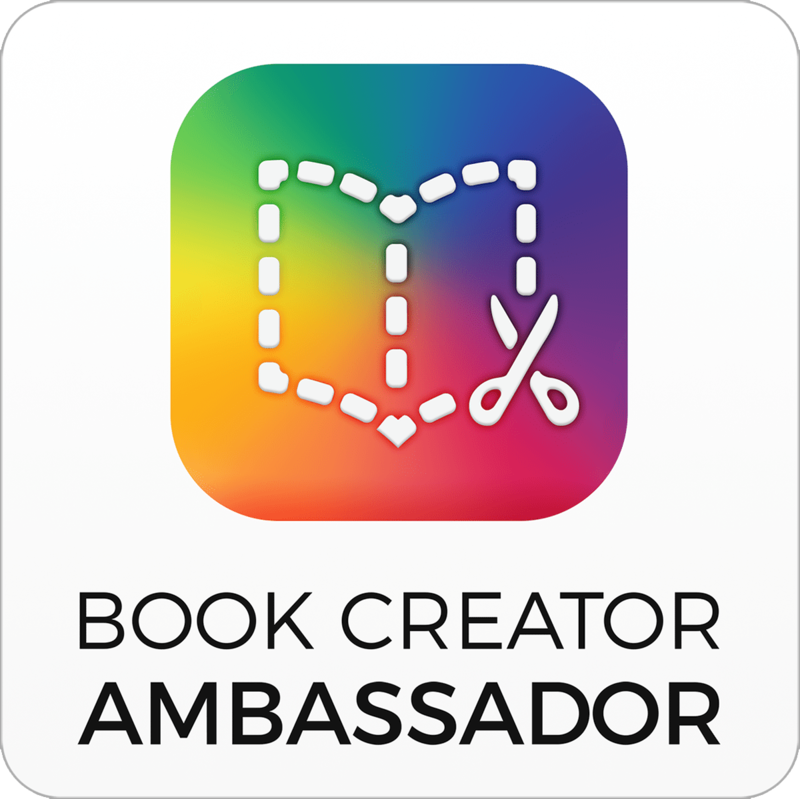 One of my professional goals this year is to help a group of students publish a book of their own original work, and Book Creator is going to be an important tool in making this happen. As Rushton Hurley says, “When students know that others will see their work, they want it to be good. When it’s just for the teacher, they want it to be good enough.” Book Creator helps students produce good work. Check out bookcreator.com for the free version for Chrome, iPad, or Android – great for an individual teacher wanting to help their whole class become published authors. Full versions can be a very affordable part of any building or district’s curriculum plan. Today, it’s easier than ever to write, edit, and publish your own material. Until recently, if you wanted your material to be viewable by the broadest range of people, you were pretty much stuck with using the Portable Document Format (PDF) for your work. PDF is a light (compared to images) format, and allows you to produce print-quality page-size copy in color. But, eventually you will want to dabble with Interactive Media, and you’ll outgrow PDF like your first pair of baby shoes. Enter ePub. The ePub format takes a standard book-page format (with text and images), and adds the ability to incorporate various multimedia elements (like sound and video). To view an ePub document, you’ll need an ePub viewer. Depending on the device(s) you like to use, several good free ones are available! Depending on what type(s) of devices you use, you’ll need to find a program or app that will read the ePub format. iBooks (iOS) – If you have an iPhone, iPad, iPad Mini, or iPod Touch, iBooks is the way to go. Lots of free books are available from the iBooks Store, and it will view PDFs and of course ePubs. The iBooks Store offers “Enhanced Books” that include multimedia elements embedded in certain pages. Booki.sh (Web-based) – Booki.sh is a web-based service that lets you manage and read ePub (and other format) documents online. This is a great option for a user with multiple devices who has Internet access practically any time. ePubReader (Firefox extension) or Readium (Chrome extension) – Read and manage ePubs right inside the browser. Chose the one that matches the browser you are currently using. If you’re not using Firefox or Chrome (why not??? ), try Booki.sh above. Adobe Digital Editions (Mac, Windows) – If you insist on reading ePubs on a Mac and not doing it through the browser, Adobe Digital Editions is my first suggestion. Also, some screen reader programs have difficulty navigating and handling ePubs inside a browser window, so Adobe Digital Editions may clear up some of those issues if you’re trying to use, for instance, NVDA on Windows or VoiceOver on a Mac. MobiPocket (multiple)- Some of my friends love this one. I haven’t used it yet, but it looks nice. Allows annotation and can be used across multiple devices and platforms. The one-click dictionary is an impressive looking feature as well! Now that you have an ePub reader, you need an ePub to read! How about this one I made using the Book Creator app on an iPad Mini? It is all about Amelia’s trip to the Cincinnati Zoo with her pre-school class. Book Creator is available for both the iPad and Android tablets.